Unwins Pheasant's Eye 'Scarlet Chalice': pack of approx 100 seeds, suitable to sow directly outdoors. A cottage garden favourite with feathery foliage. Adonis aestivalis (hardy annual) - is great for providing almost instant colour in summer borders and makes a splendid gap filler. Scarlet Chalice produces a fine show of red and black blooms just about anywhere. 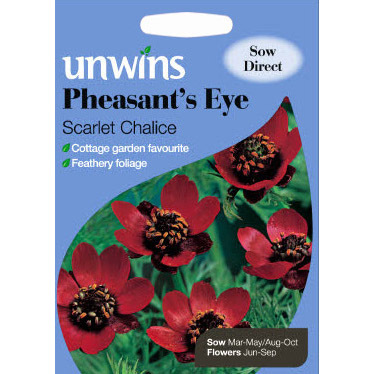 If you would like further information about Unwins 'Scarlet Chalice' Pheasant's Eye Seeds, please contact our garden centre at Shawbury just outside Shrewsbury in Shropshire, by calling 01939 251315 or emailing.